I’ve been an Interfaith Mom for 21 ½ years. There’s not much that I do half-way. So, I embraced the challenge I had given myself to raise my children Jewish. I sent my children to a Jewish preschool. I drove them to/from religious school. I even moderated a “How to Plan a Bar/Bat Mitzvah” discussion at the synagogue. However, I never imagined that I’d be writing to you as a professional in a Jewish agency! When I was asked to write about raising kids in an interfaith family in December, my mind went back to the Christmas night a couple of years ago, when my family spent Christmas night at Shabbat Services! We had spent the past 24 hours with much of my very large Catholic family: Christmas Eve in one house, Christmas dinner at another. On the way home, on a warm and rainy Christmas night, we decided to take a drive through the nearby light show. We passed the local Chinese restaurant, and it was packed. We knew that there were certainly enough Jews for a minyan. Then my husband mentioned that there were services at our synagogue in an hour. I said, “I’m game.” My daughter said that she’d like to go to services before returning to college. Son was not as enthusiastic, but he didn’t complain either. So, after listening to Christmas carols on Pandora as we viewed the light show, I said good-bye to Christmas for the year by pausing the carols at the conclusion of the song. Then we pulled into the synagogue parking lot. We were the only interfaith family in attendance, but we weren’t the only family. It was a peaceful and enjoyable way to end the holiday. During services, my son, who by no fault of his own, had a rather unique formal Jewish upbringing, sang out strong – reading either the Hebrew or having memorized the blessings. My daughter, a freshman in college, was there by choice. I felt that, as an interfaith family, my husband and I had done what we set out to do. Although my husband and I made the decision to raise our children Jewish, let’s face it, the decision was ultimately mine to make. I can’t lie; this month is never easy. Every single button gets pushed the moment I walk out the door or turn on the TV. I will always wonder what would have been. What would my tree look like? How many gifts would be under it? Would my stair rail be wrapped with greens? Would the lawn and house be draped with lights? Would we go to Mass on Christmas Eve or Christmas Day? Would the church be breathtaking? Everyone seems to think that I’ve got it all together and can’t imagine why I get anxious after doing this for 20 years. No one seems to “get” it. Sometimes I don’t understand it either. But, I do enjoy the season despite an unexpected burst of tears here and there. A colleague of mine compared this holiday season to unraveling a ball of Christmas tree lights. (If you’ve never done it, trust me; it’s not fun.) While the final product can be magical and filled with joy, getting there can be stressful. 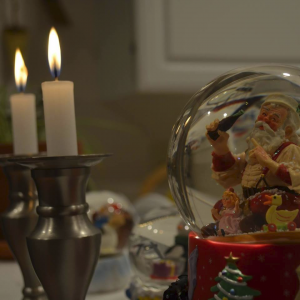 As an interfaith mom, that’s how I often feel during December, like a tangled ball of lights. There are some “interfaith” parents who might replace the word interfaith with bi-cultural. Why? Because they, like me, are raising their children in a Jewish home rooted in Jewish theology – in one faith. They may consider themselves Italian or Irish. However, like my children, their children consider themselves Jewish, not half-Jewish. Although these families celebrate Christmas at home or with their extended Christian family, there is no religious significance to the holiday. Instead, they are celebrating the culture that they share with their Mom’s or Dad’s side of the family and showing respect to the half of their family with a different religion. These are the people who love them the other 11 months of the year. These are the same grandparents who attended religious school and Jewish preschool programs. These are the grandparents, aunts, uncles, and cousins who lit a candle at their B’nai Mitzvah. So, when a Jewish child says, “We’re going to my grandparents’ house tonight to decorate the Christmas tree,” take a deep breath. The reality of it is, they are celebrating a holiday, not a holy day. For my children, there is no lack of clarity of who they are or what they are. They are part of the melting pot that we embrace in the United States; they retain their Jewish identity while being part of a larger whole. L’dor v’dor has a different meaning for my family. 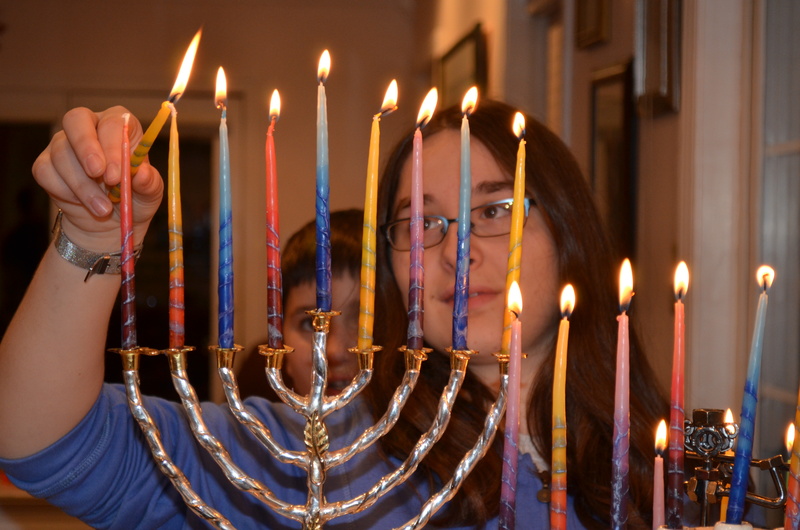 We embrace the tradition that joins one generation to the next, even when some of those traditions aren’t Jewish. By building memories with their Catholic family, they are deepening their understanding of their own family history. However, there is no question in their minds; my children are Jewish. Celebrating a family holiday does not compromise their Jewishness. If you’d like to read more about my story and what we do at my house during this time of year, I hope you’ll read my personal blog, Interfaith Mom. Virginia Glatzer is Jewish learning Venture’s Director of Educational Consultation and Support. She works closely with our Education Directors by providing opportunities for them to grow as professionals through retreats, networking meetings, ongoing professional learning, special interest groups, and one-on-one coaching. She represents JLV in Shinui: the Network for Innovation in Part-Time Jewish Education and is also part of our Havayah team. Virginia has been an educational leader in two statewide projects as a Regional Mentor Coordinator with the PA Institute for Instructional Coaching and as a PDE Mentor for Classrooms for the Future. She is an instructional technology consultant for school districts and facilitates a professional learning community for future Principals on educational leadership topics.